Does your skin ever feel like it’s on fire? I’m talking blotchiness, redness, itchiness and that uncomfortable feeling of tightness and dryness. That’s exactly what I go through whenever my skin suddenly turns sensitive. It can be due to weather changes, new medication (something my skin is very picky about since going off Accutane) or introducing a new product. Cleaning + disinfecting your makeup brushes and sponges should also be something that you do on regular basis. If you find yourself being prone to rashes or itchy skin on your arms, legs, back, you might want to try switching to a dye and fragrance-free laundry detergent– it’s been a game changer for me. A face mask. Okay, so the majority of the face masks in my collection aren’t suitable for sensitive skin and that is one type of product I avoid using when my skin feels sensitive. Other than Complex’s Beauty Ocean Potion which is an old favorite, I also recently fell in love with REN’s Evercalm Ultra Comforting Rescue Mask. 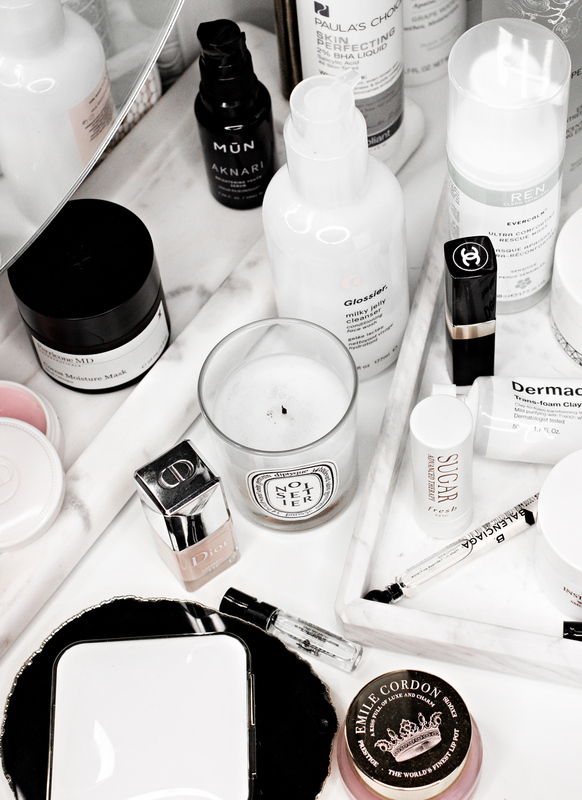 * I think that when it comes to cleansers and moisturizers, there are countless options, but not much in terms of “treatment” such a face mask. 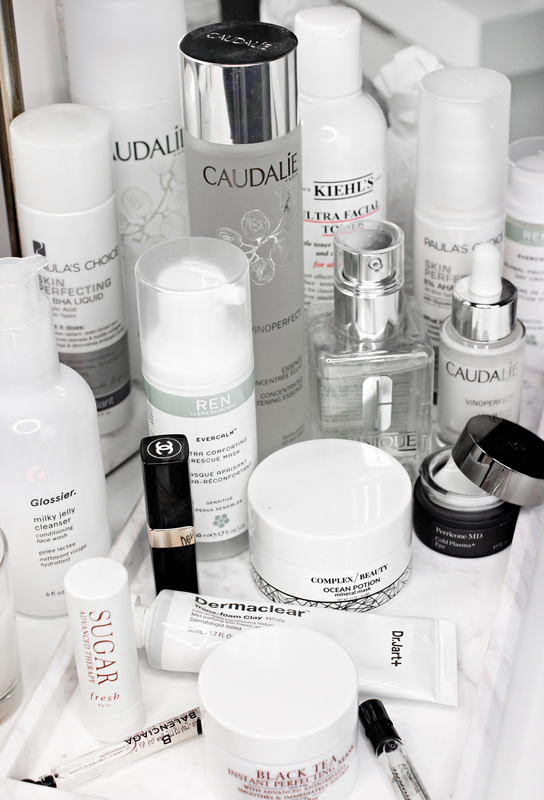 I’ve tried quite a few products marketed toward “sensitive” skin and a lot of them were anything but that. 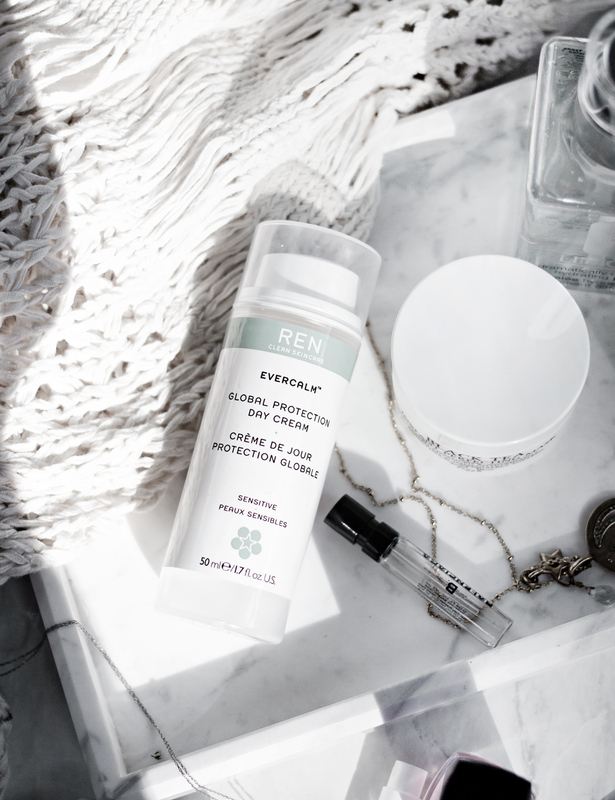 Well, REN’s Evercalm Rescue Mask was a pleasant surprise as it is actually an amazing soothing and calming treatment- which worked great, even with my picky, acne-prone skin. It has a very thick, creamy formula that calms the skin, without leaving it feeling greasy- just soft and hydrated. Face Mist. This is where it pays to keep things as simple as possible. I usually do so with Caudalie’s Grape Water (but stay away from their Beauty Elixir which I usually love, but it does not work very well with sensitive or irritated skin) or Mario Badescu’s Aloe, Herbs and Rosewater Mist. 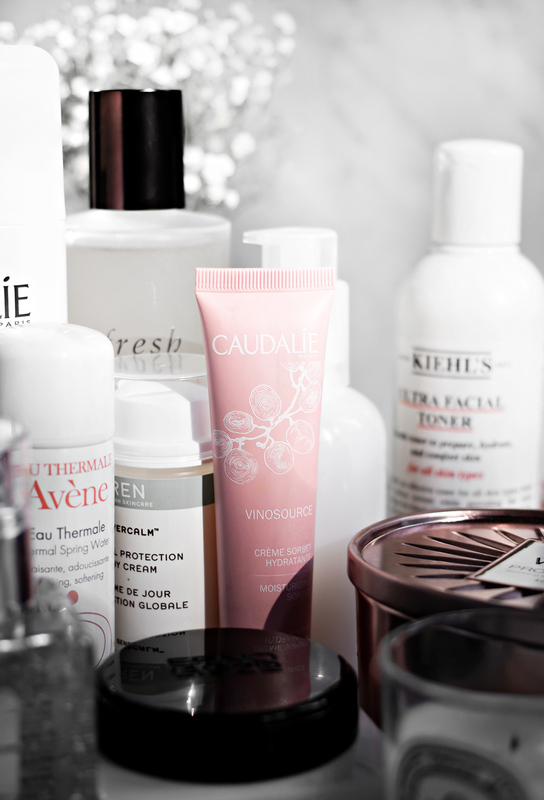 Some face mists contain a lot of artificial fragrance and those do more harm than good, so always check the ingredients. An essence is probably one of the first things I reach for when my skin is feeling sensitive. 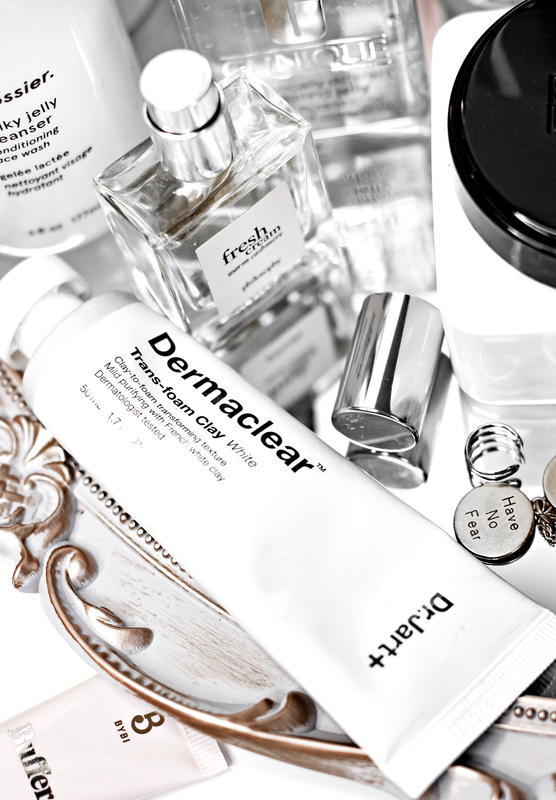 After cleansing, your skin should feel comfortable, not dry or tight. Back when I really struggled with acne, I’d literally scrub my face and cleanse it up to 4 times a day. The minute I decided to be gentle with my skin, was when everything changed. 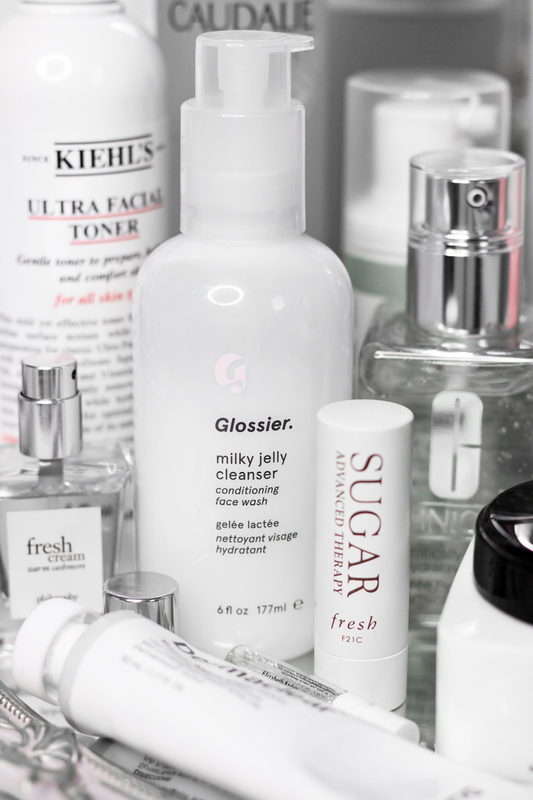 I switched my harsh cleansers for more gentle and very simple formulas like CeraVe’s Cleanser, MUN’s Akwi for when I double-cleanse and Glossier’s Milky Jelly Cleanser. Pixi’s Pixiglow Tonic and Paula’s Choice Skin Perfecting BHA Liquid are usually gentle enough to use even when my skin is irritated, but as I mentioned, I also love essences. SKII’s Essence is a beautiful product that I love and have purchased a few times, but I’m just not sure if it’s worth the price tag as other products such as Misha’s Essence work just as good. Also, Fresh Black Tea Kombucha Essence* has recently been added to my favorites and I’ve been using it daily for weeks now. It’s, again, gentle, it absorbs nicely and works really well with dry and sensitive skin. Dry skin usually goes in hand with sensitive and/or irritated skin. When it comes to hydrating it’s again, best to keep things simple. 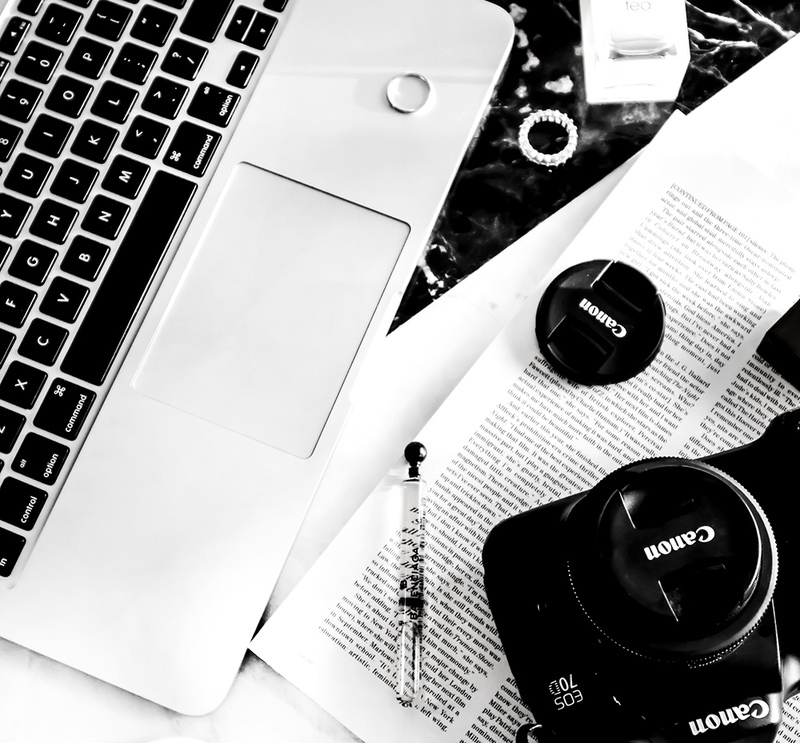 I’m pretty sure you’re tired of hearing me talk about the Cetaphil Cream, so… well, I was going to say I won’t mention it, but I just did, so there. Rosehip Oil is a nice, lightweight option to reach for. If you’re feeling like treating yourself to something really special and ultra-lightweight, I suggest trying Caudalie’s Vinosource Moisture Sorbet. It has a very soft, lightweight, fluffy formula and most importantly, it doesn’t irritate sensitive skin and leaves it feeling hydrated and soft. I’ve been a huge fan of Clinique’s Dramatically Different Moisture Lotion for years, as well as their new Dramatically Different Hydrating Jelly and the Moisture Surge Gel. Whenever some of my friends ask for a recommendation for a moisturizer that isn’t greasy and works with sensitive skin, I always give them samples of the Moisture Surge, and everyone always ends up buying a full-sized version. The Hydrating Jelly feels a bit similar to the Moisture Surge Gel but isn’t as rich and it just melts into the skin. If you have acne-prone, often red and irritated skin, the Moisture Sorbet and the Dramatically Different Hydrating Jelly are great products to explore/sample as both are fast-absorbing and do not feel heavy, while still hydrating the skin. I previously talked about sealing my moisturizer with Aquaphor and how much it helps me when my skin is dry/dehydrated/sensitive. After I am done with my PM routine and apply my moisturizer, I wait for it to absorb and seal it with Aquaphor. I take a very small amount, rub it between my fingers and gently press it into my skin. I always wake up to my skin feeling extremely soft and supple when doing this. I am aware that there are a lot of beauty lovers who hate on products like Aquaphor, but I personally never had a problem with mineral oil/petroleum jelly products (do your own research– there is a lot of misinformation out there and no scientific proof exists that mineral oil is comedogenic to human skin). Aquaphor isn’t actually absorbed, but instead, it acts as a “seal” to help your moisturizer and as an occlusive, it prevents water loss. I’ve used this technique for many years now and it works wonders for my skin- the key is to not use too much product and follow up with a good cleanser in the morning. 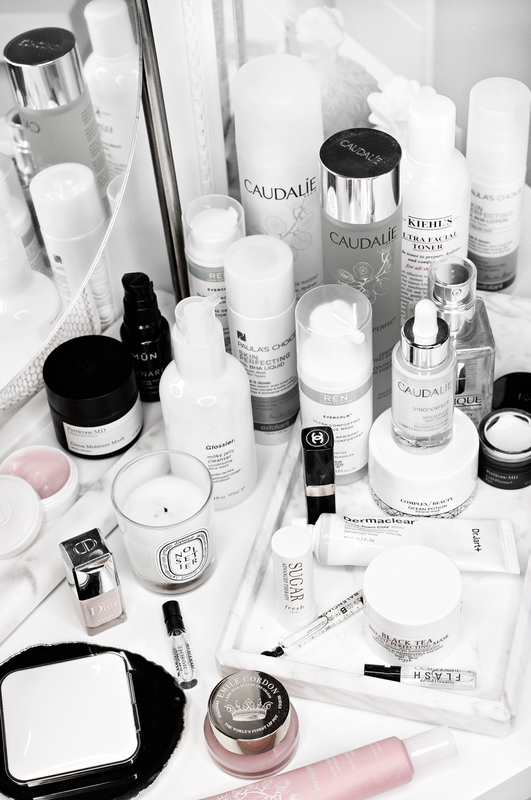 I love a good, strong acid treatment as nothing helps my skin look better, but when my skin’s on the sensitive side, I only reach for gentle treatments. The same goes following other treatments such as waxing, etc. Many years ago when I was in high school I used a strong BP acne treatment the same day I waxed my eyebrows and upper lip, and ended up with burns all over my mouth. It was not pretty, and a very important lesson was learned that day. For an overnight hydrating treatment: Erno Laszlo’s Memory Sleep Mask which is incredible, although a very pricey product. Laneige Sleeping Mask is much more affordable and also a very nice overnight treatment. If I need something slightly purifying that helps with oiliness and clogged pores but isn’t too intense or drying, I go with one of Dr. Jart’s Dermaclear Trans-Foam wash-off clay masks. For those struggling with a lot of redness, I cannot recommend IT Cosmetics Bye Bye Redness Cream– hands down one of my favorite products from the brand.